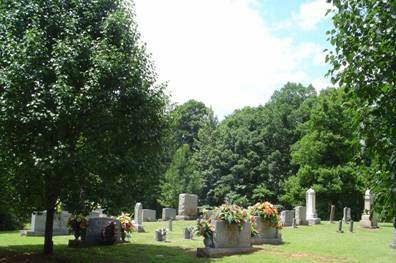 The Oak Grove Cemetery is in South Central Wayne County, Tennessee. To reach the cemetery from Collinwood, Tennessee, travel State Hwy. 13 south for approximately 11.6 miles. Turn right (west) onto State Hwy. 227 (Pumping Station Rd.) and go 3.1 miles. Turn right (north) onto George Olive Rd. and then left down the hill on a narrow paved road. This cemetery is owned and maintained by the Oak Grove Missionary Baptist Church and is well taken care of. The cemetery lies to the north/northeast of the church beside the road. Josiah Fowler was the founder of Oak Grove Cemetery as noted on his headstone. Arnold, Lillie M.; b. 09 Jun 1899, d. 20 Aug 1983, wife of Fernando D.
Bailey, infant; b. 18 Nov 1900, d. 18 Nov 1900, infant of J.N. & M.A. Fowler, Andrew; b. 22 Jun 1909, d. 05 Jan 1918, son of J.H. & M.B. Fowler, Bessie; b. 11 Dec 1899, died @ 11 months of age, daughter of M.L. & M.B. Fowler, Cora E.; b. 18 Oct 1896, d. 16 Jan 1920, daughter of M.L. & M.B. Fowler, Floyd; b. 11 Jul 1916, d. 28 Jan 1918, son of J.H. & M.B. Fowler, H.C.; b. 18 Apr 1843, d. 28 Jun 1914, wife of L.D. Fowler, Hattie; b. 31 Mar 1894, died @ 18 months of age, daughter of M.L. & M.B. Fowler, infant twin; b. 19 Oct 1908, d. 22 Oct 1908, son of W.R. & A.J. Fowler, Jogie Ellen; b. 17 Dec 1903, d. 25 Oct 1905, daughter of J.H. & M.B. Fowler, L.D. ; b. 10 Jan 1846, d. 23 Mar 1926, husband of H.C.
Fowler, Levi W.; b. 22 Mar 1887, d. 19 Dec 1893, son of L.D. & H.C.
Fowler, Lola A.; b. 09 Nov 1894, d. 02 Sep 1896, daughter of J.H. & M.B. Fowler, Mary Joe; b. 16 May 1904, d. 02 Aug 1905, daughter of M.L. & M.B. Fowler, Ranzie F.; b. 08 Mar 1913, d. 04 Feb 1921, son of J.H. & M.B. Fowler, Richard; b. 11 Apr 1902, d. 02 Dec 1902, son of M.L. & M.B. Fowler, Sarah A.; b. 26 Feb 1882, d. 11 May 1901, daughter of L.D. & H.C.
Griffin, Vicky L.; b. 06 Aug 1946, only date, wife of David J.
Hays, infant; b. 21 Aug 1889, d. 21 Aug 1889, son of J.R. & A.E. Keeton, Cora E.; b. 06 Sep 1905, d. 11 Nov 1963, wife of Henry H.
McClanahan, Angie; b. 06 Oct 1856, d. 01 May 1908, wife of J.C.
McClanahan, Martha G.; b. 23 Apr 1846, d. 27 Aug 1883, wife of Thomas P.
McClanahan, Willis E.; b. 17 Jul 1877, d. 13 Dec 1910, son of T.P. & M.C. Morgan, no given name; b. 02 Feb 1922, d. 02 Feb 1922, daughter of L.A. & M.L. Saxon, J.L. ; b. 29 Dec 1862, d. 10 May 1904, wife of G.R. Spain, infant; b. 09 Aug 1899, d. 09 Aug 1899, son of Charlie A. & Rachel M.
Spain, John Homer; b. 09 Aug 1899, d. 23 Mar 1910, son of Charlie A. & Rachel M.
Spain, Rachel M.; b. 30 Dec 1861, d. 04 Apr 1933, wife of Charlie A.
Spain, Ruth E.; b. 29 Aug 1844, d. 06 Mar 1924, wife of Eli A.
Strait, Bessie A.; b. 21 Jan 1929, wife of Homer C.
Wallace, infant; b. 27 Oct 1903, d. 27 Oct 1903, infant of R.L. & M.L. Wallace, M.L. ; b. 21 Dec 1882, d. 09 May 1927, wife of R.L. Wallace, Virlie; b. 01 Aug 1906, d. 21 Sep 1909, daughter of R.L. & M.L.